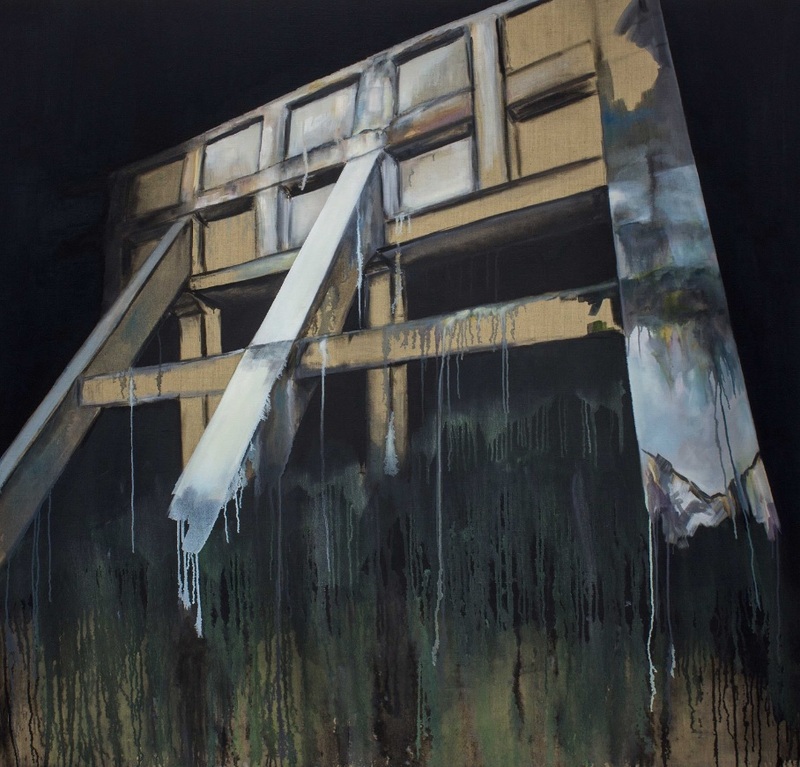 Since graduating from our MA Painting course last year, artist Steven Ingman was named one of the recipients of the Ingram Collection’s Young Contemporary Talent (YCT) Purchase Prize Exhibition 2016. His work Temple of Industrial Devotion IV, 2016 has been purchased by the renowned Ingram Collection, which is one of the UK’s foremost and most significant private collections of Modern British art. We spoke to Steven about how it feels to be the recipient of the YCT Purchase Prize, his interest in capturing derelict degraded spaces through paint and what he enjoyed most about studying MA Painting at Wimbledon. 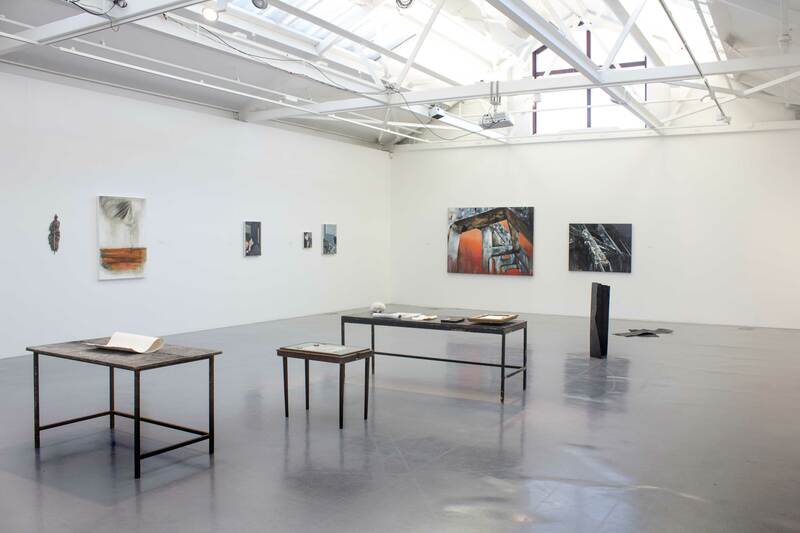 How did your work come to be selected for the Young Contemporary Talent Purchase Prize exhibition? The exhibition was organised by the Ingram Collection, who had purchased a piece from my final show. The prize was free to enter and was open to anyone who graduated from a UK art institution in the last three years. I thought it was an excellent opportunity and I entered my work for consideration by a panel of judges. I was excited to have been shortlisted among the other 27 artists and to be exhibited at the Cello Factory in London. How did it feel to win this prestigious prize? I really didn’t expect to win as the standard of work in the exhibition was incredibly high and featured graduating fine art students from all over the UK. It was a complete shock when my name was read ­­out by Chris Ingram, the founder and owner of The Ingram Collection. The prize awarded by the Ingram Collection was a purchase prize and my painting Temple of Industrial Devotion IV, 2016 was purchased for the collection. The Ingram Collection comprises work by some of the major British artists of the 20th century and features work of Modern British and Contemporary art from the last 100 years. The Collection is also dedicated to supporting recent fine art graduates through a program they are calling the Young Contemporary Talent (YCT) of which this prize is a part. It means a great deal to me for my work to be part of such a prestigious collection and to have the opportunity for it to be displayed alongside such great names in British art. I received payment for the purchase of my painting and I am planning on using some of the funds to support the development of new work. The rest will be used to fund my living expenses for the next month. I would say that I am landscape painter and that I am fascinated by the relationship between the natural and the man made world. The source material for my paintings is places that I have found through hiking and walking. In all the locations that I have documented, I have spent time wandering, whether it was the hills of the Peak District or a stroll around a city. The places that I paint are locations that have struck a chord and made me express something more than just being in that moment. They emit an energy that I find a connection with and something that I want to pursue in the language of paint. My recent work has found me exploring ideas around the ruin or areas of wasteland and edgeland. These areas have a mystery to them and I often find myself asking questions, as well as finding it intriguing that nature has been allowed to run wild there, creating a sense of wilderness. As a painter I just love the medium of oil paint and I would say that my work takes influence from the long tradition of painting. My studio is often a very intoxicating environment that has a strong aroma of turpentine and fresh oil paint. I would describe myself as quite a messy painter and the floor often ends up with more paint on it than the canvas. My style is forever evolving, but as it stands I am interested in creating paintings that incorporate elements of abstraction and representation. I build the paintings up in layers and I like to give the viewer hints into the process of the painting. Like many painters I find that I am often drawn up close to the canvas’ surface, finding an interest in small abstracted sections – I think it’s the tactile way that the material of paint works with the canvas, it is very hands on. What did you enjoy most about the MA Painting at Wimbledon? I thoroughly enjoyed my time at Wimbledon College of Arts, my only qualm was that the year went too quickly! I think the most outstanding quality and enjoyable aspect was the college itself. Its location on a tranquil leafy street, combined with supportive and welcoming staff and students offer an inviting creative environment that I feel makes Wimbledon feel special and unique. I enjoyed much of the new MA Painting course and I found it to be one of the most important years in the development of my practice overall. The course benefitted from having a small group which enabled us to quickly bond and make connections that helped us form a vibrant studio atmosphere. This had a positive impact on my work and made the making time an exciting process of experimentation, resulting in a strong body of work. The course leader Geraint Evans strived to ensure we had the guidance, support and facilities to achieve our end goals and his friendship and dedication to the group made it all work. Throughout the course there was an excellent range of visiting speakers, lecture programmes and panel discussions that generated ideas and gave a glimpse of what it’s like to practice as a creative professional. I really enjoyed the weekly reading group sessions that offered the opportunity for us to be critical and provided thought-provoking conversations surrounding paint, politics, society and art in general. These sessions would comprise of many activities: from analysing a text, to watching a documentary, to a gallery visit. I feel the reading groups enhanced my understanding of critical writing and allowed me to contemplate and form new ideas. Other brilliant aspects of the course were the field trips; my favorite was our day trip to Oxford to see the Ashmolean, which happened to have an amazing Jenny Saville drawing exhibition on at the time we went. The last three months was probably my favorite part and a great chance to hone in and consolidate the knowledge I had gained on the course. I was given a larger studio enabling me to really engage with paint. This sense of freedom and space to explore my ideas on a grand scale fueled my love for the medium and enabled me to work on several large paintings. I was very happy during my time at Wimbledon and I would recommend the college to anyone. How did your practice develop throughout the course? This was an important year in the development of my practice. It grounded my work both practically and conceptually, as well as being a benchmark for new knowledge and skills that would forward my practice in the future. Over the course of the year I developed a body of research that explored my ideas and interests in painting. I continued to question and experiment through sketches and digital collage. Collage was a new area for me and the support from the course enabled me to channel my ideas in creating paintings that combine aspects of representation and abstraction, something that I had ideas about but had never really realised before through the painting process. It allowed me to be more diverse in the handling of paint, a sense of freedom of expression and the ability to build up the layers of paint that allowed the viewer an insight into the process of making a painting. Wimbledon’s lecturers and technical staff were amazing and always ready to help with a question or support. I found that my practical understanding in the material of paint, its mediums, grounds and the supports to paint on was significantly furthered. This was also due to the facilities that Wimbledon had to offer. Through academic critical writing and the supporting research undertaken for the essays and online portfolio I became more aware of my work and how to communicate it through academic means. I also found that I developed more ideas for painting and found an overall greater confidence in my practice. The visiting lecture program, reading groups, seminars and panel discussions informed my ideas but also gave me knowledge for the future. They gave me an insight into how some artists think and express their ideas but also how they achieve their goals. I was able to find out information on things like funding or career opportunities available to artists. One unit on the course made me consider how painting can be informed by other forms of research and used to exchange ideas, generating a form of interdisciplinary practice. This line of thinking would open up other avenues to consider when applying for funding or opportunities. Overall being a student on the MA Painting course at Wimbledon College of Arts afforded me the thinking and making time to develop my work in a stable and supportive environment. It enabled me to develop new skills and have a greater understanding of my ideas and creative processes as an artist. My MA final show was in September 2016 and my work was well received, which resulted in purchases by two collectors. I feel the consolidation of my final show demonstrated the progression and development of my practice. My plan at the moment is to spend time in the studio developing a strong body of work with the intention of building on the success of my MA degree show. I hope to experiment and continue the development in the practical application of paint and the combination of abstraction and representation. This new work will further explore my interest in the ruin and the connections that society makes with such structures. 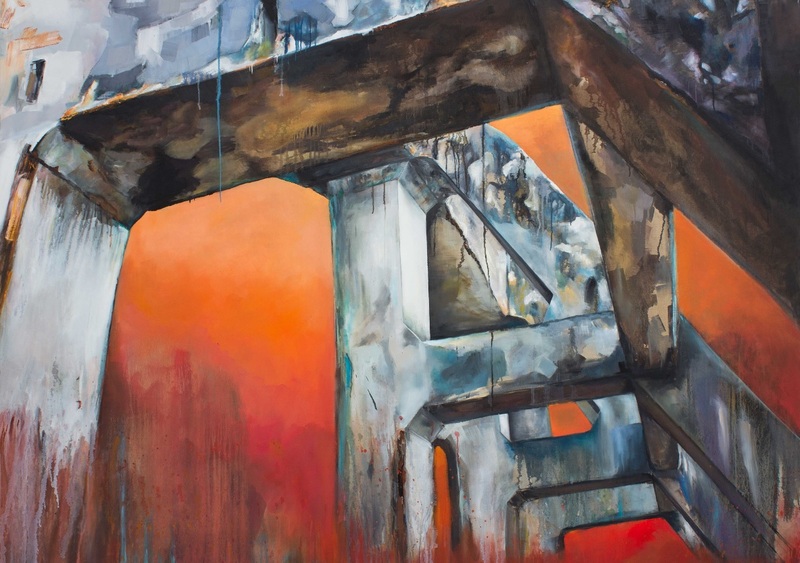 In this I will allow for a greater engagement in the work and portray the ruin with greater ambiguity, furthering the ruin’s multi-layering of narrative and history. In researching the structures, I plan to consider and question what the catalyst was for the building’s demise. I will also further my investigation into academic writings and the contemporary debate about our fascination with the ruin. I have been fortunate to have been asked to contribute to a project that will be running for 12 months. Dependent on funding, this project would see me siting myself in the region of Grimsby and Cleethorpes. I am excited by the prospect and this project will build on the conceptual ideas that have arisen within my practice. It will enable me to consider the impact of the economic and political changes on the local population, industry and economy. 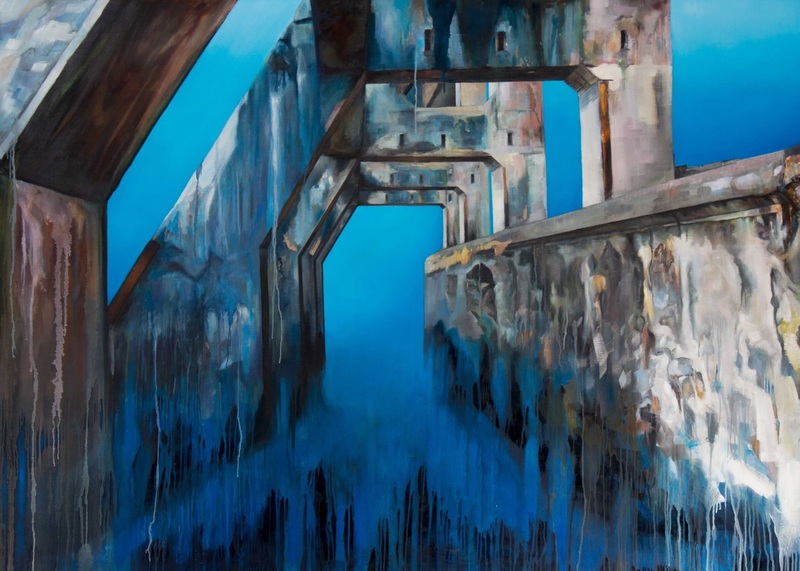 Through this I can develop a body of paintings that will examine the urban and industrial architecture and convey the changing structural aesthetics, while unearthing the hidden historical narratives and potential futures. I have also been approached for a couple of private commissions that are a direct result of the work I completed on my MA and will continue on a similar vein. You can learn more about Steven and his work by visiting his website and following him on Instagram and Twitter. 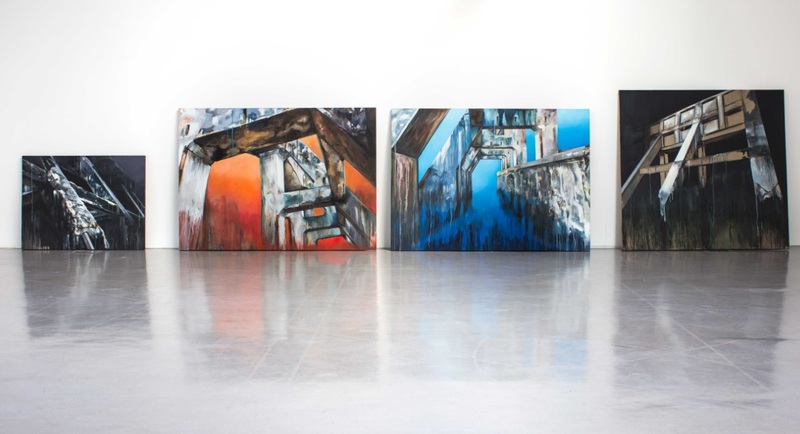 Find out more about studying MA Painting at Wimbledon College of Arts.